State of the game in MLS: Is there a North American "Leicester City"? By far, the biggest story from the 2015-2016 soccer season is Leicester City, a 5000-1 underdog winning the English Premier League. After clinching the improbable title, everyone in the media is jumping on the bandwagon regarding this great underdog story. Although sometimes cringe-worthy, with people calling them "Lee-ster", “Lie-chester”, or thinking their nickname the Foxes is part of the club name as we have in North America, you can still understand how the story is newsworthy beyond England and the sport of soccer. In many ways, writing this article falls in the same "click-bating" circle, however, for someone who follows the game closely it’s hard not to want to further understand what happened and see what it says about the sport. Usually in these types of scenarios, it is a chance for me to brag and say I told you so. In the past of my scouting work, I identified Jamie Vardy playing in the England National Conference and Riyad Mahrez in Ligue 2 in France, and have contact with the backroom management of Leicester and how they identify players. I'm pleased the club achieved this pinnacle of success, however, when I was previewing the 2015-2016 season I predicted Leicester to finish 20th overall. The side story that is lost in Leicester’s success was that of former head coach Nigel Pearson, who was fired after his son and a player on the team was caught in an off-season tabloid scandal while on a promotional tour in Asia. This left the club in disarray last summer and along with the loss of their key player from the previous season, Esteban Cambiasso, is one of the main reasons why the odds against Leicester were so high going into the season. New manager Claudio Renieri, who has had a great career as a manager, was also known for not handling pressure or being out coached when at higher profile clubs. These reasons, and the fact I didn't think Vardy and Mahrez would automatically be given the starting roles, lead to my prediction. There are many interesting stories regarding what Leicester did this season to win the title, such as being the third worst possession team and worst passing team in the Premier League. These are two stats that many smart footballing people say are needed to be successful, especially when you are talking about player development and grassroots soccer. Of course, in the case of Leicester, this doesn't mean they can't possess the ball or pass it. What this shows is how direct they were playing in comparison to other teams in the league; almost playing a more "English Style" of soccer, something that recently been identified as a style you will never win with. Leicester was also successful in winning the games they had to. The club struggled against some of the top sides, losing to Arsenal twice, losing to Liverpool, tying Manchester United twice, tying Tottenham Hotspur and Manchester City at home, with the only real upsets being their away wins against both of those teams. What Leicester did very well was win against the poorer clubs in the league, which is true in all sports. Despite upsets being exciting, you win championships by winning the games you have to win. Poor seasons from traditional title favorites Arsenal, Manchester United, Manchester City and Chelsea also led to the Foxes victory. Another interesting thing I've noticed in analyzing the Leicester squad is the positive comparison it has with Toronto FC in Major League Soccer. Toronto, who has so far in 2016 have adapted a more defensive style of play, and depend on the play of Sebastian Giovinco and Jozy Altidore to score or set up goals. 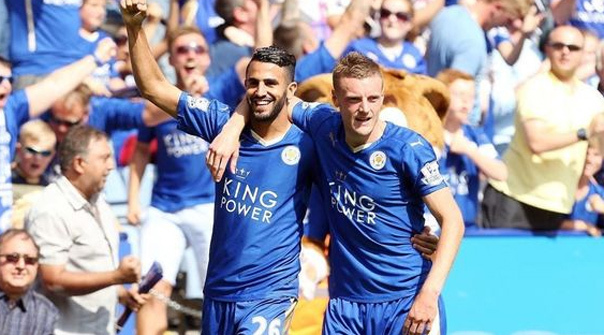 This is similar to Vardy and Mahrez, who were involved in 49 of Leicester City 63 Premier League goals. Although Leicester’s success was not only the goal scoring proficiency of Vardy and Mahrez, as the team showed great play by their holding midfielders N'Golo Kante and Danny Drinkwater, who compare well to Micheal Bradley and Will Johnson. Finally, they also have a very consistent and strong back five (goalkeeper - defenders) which Toronto FC is also showing eight games in the 2016 MLS season. The one player Toronto FC is lacking from a comparison-standpoint is Leicester’s wide midfielder Marc Albrighton, who provided an additional threat with his 216 crosses and taking 41 shots on net, providing Leicester more offense and taking pressure off both Verdy and Mahrez. So far, Toronto’s version of this, be it Jonathan Osorio, Marco Delgado or Tsubasa Endoh, have struggled to be a factor in games which make Toronto less dynamic in a MLS comparison to Leicester. Leicester also had great luck with health, so much so the starters so far this season played 87% of the club’s minutes, which is an exceptional number in modern day football. Given their history, while it might feel that way to many Toronto FC fans, the Reds are not 5000-1 in winning the MLS championship. Many books have them as the third or fourth top team in the MLS, which shows some of the differences between both leagues, because if the two clubs played Leicester would be heavy favorites. Toronto’s ten year wait for success also doesn't compare to Leicester’s 132 year wait for their first English title. This provides perspective, but also hope that one of the greatest cliches in sports is true: any club can win and the Leicester story give great hope to any supporter that their club, no matter what the experts say, always have a chance even if it is 5000-1.